The U.S. Department of Transportation has analyzed dozens of data recorders from Toyota Motor Corp. vehicles involved in accidents blamed on sudden acceleration and found that at the time of the crashes, throttles were wide open and the brakes were not engaged, people familiar with the findings said. The results suggest that some drivers who said their Toyota and Lexus vehicles surged out of control were mistakenly flooring the accelerator when they intended to jam on the brakes. But the findings don’t exonerate Toyota from two known issues blamed for sudden acceleration in its vehicles: sticky accelerator pedals and floor mats that can trap accelerator pedals to the floor. Associated Press A recalled Toyota gas pedal is posed next to a recalled Toyota Avalon at a dealership in Palo Alto, Calif. The findings by the National Highway Traffic Safety Administration involve a sample of reports in which a driver of a Toyota vehicle said the brakes were depressed but failed to stop the car from accelerating and ultimately crashing. The data recorders analyzed by NHTSA were selected by the agency, not Toyota, based on complaints the drivers had filed with the government. The findings are consistent with a 1989 government-sponsored study that blamed similar driver mistakes for a rash of sudden-acceleration reports involving Audi 5000 sedans. The Toyota findings, which haven’t been released by NHTSA, support Toyota’s position that sudden-acceleration reports involving its vehicles weren’t caused by electronic glitches in computer-controlled throttle systems, as some safety advocates and plaintiffs’ attorneys have alleged. More than 100 people have sued the auto maker claiming crashes were the result of faulty electronics. NHTSA has received more than 3,000 complaints of sudden acceleration in Toyotas, including some dating to early last decade, according to a report the agency compiled in March. The incidents include 75 fatal crashes involving 93 deaths. However, NHTSA has been able to verify only one of those fatal crashes was caused by a problem with the vehicle, according to information the agency provided to the National Academy of Sciences. That accident last Aug. 28, which killed a California highway patrolman and three passengers in a Lexus, was traced to a floor mat that trapped the gas pedal in the depressed position. 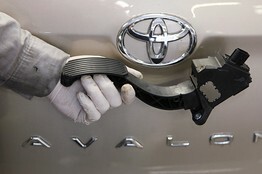 Toyota has recalled more than eight million cars globally to fix floor mats and sticky accelerators. A NHTSA spokeswoman declined to confirm the results from the data recorders. She said the agency was continuing to investigate the Toyota accidents and wouldn’t be prepared to comment fully on the probe until a broader study is completed in conjunction with NASA, which is expected to take months. Transportation Department officials, however, have said publicly that they have yet to find any electronic problems in Toyota cars. Daniel Smith, NHTSA’s associate administrator for enforcement, told a panel of the National Academy of Sciences last month that the agency’s sudden-acceleration probe had yet to find any car defects beyond those identified by the company: pedals entrapped by floor mats, and “sticky” accelerator pedals that are slow to return to idle. “In spite of our investigations, we have not actually been able yet to find a defect” in electronic throttle-control systems, Mr. Smith told the scientific panel, which is looking into potential causes of sudden acceleration. Toyota officials haven’t been briefed on NHTSA’s findings, but they corroborate its own tests, said Mike Michels, the chief spokesman for Toyota Motor Sales. Toyota’s downloads of event data recorders have found evidence of sticky pedals and pedal entrapment as well as driver error, which is characterized by no evidence of the brakes being depressed during an impact. Some company officials say they are informally aware of the NHTSA results. But Toyota President Akio Toyoda has said the company won’t blame customers for its problems as part of its public-relations response. Toyota is still trying to repair damage to its reputation caused as much by disclosures that the company hid knowledge of safety problems with its vehicles as by the reports of sudden acceleration. NHTSA levied a $16.4 million fine against Toyota earlier this year for failing to notify the agency in a timely manner about its sticky-accelerator issue. Toyota’s handling of a rash of safety complaints involving high-profile models such as the hybrid Toyota Prius has prompted Congress to consider a far-reaching overhaul of U.S. auto-safety laws. Last week, Toyota announced it had taken steps to improve its vehicle quality, including moving 1,000 engineers into a new group that will try to pin down problems. The Japanese auto maker also will extend development times by at least four weeks on new models to do more testing and will cut down on the use of contract engineers.Toyota showed reporters the inner workings of its labs, including how it has been testing its electronic throttle control module to find any malfunctions. The system is controlled by a main computer and has a second computer as a backup if the first fails. In either instance, failures should be noted in the car’s main computer and result in engine power being cut. The car maker also has tested its vehicles’ responses to strong electromagnetic radiation, such as the waves generated by cellphones and radio towers, which some critics have said could be causing a malfunction. The only interference engineers have encountered after bombarding cars with electromagnetic waves is static on the car radio. U.S. Reps. Bart Stupak (D., Mich.) and Henry Waxman (D., Calif.) have been critical of Toyota’s efforts to track down alternative causes of unintended acceleration. They have said Toyota has been slow to react or evasive. Toyota has said it is doing everything in its power to respond to both Congress and customer complaints.